Is it just me, or do the pages in your cookbooks with the recipes you use the most always end up looking like this? If you’ve been reading for awhile, you’ll know that I have a thing for Mollie Katzen’s recipes, and this copy of The Moosewood Cookbook was the first cookbook I ever bought. As you can see, it’s well loved. I buy a lot of things in bulk in order to save money, so there are often times when I’ve got a large quantity of something on the verge of expiring that I need to use up quickly. This morning was one of those times, as I had a big tub of cottage cheese in the refrigerator that was rapidly approaching its demise. 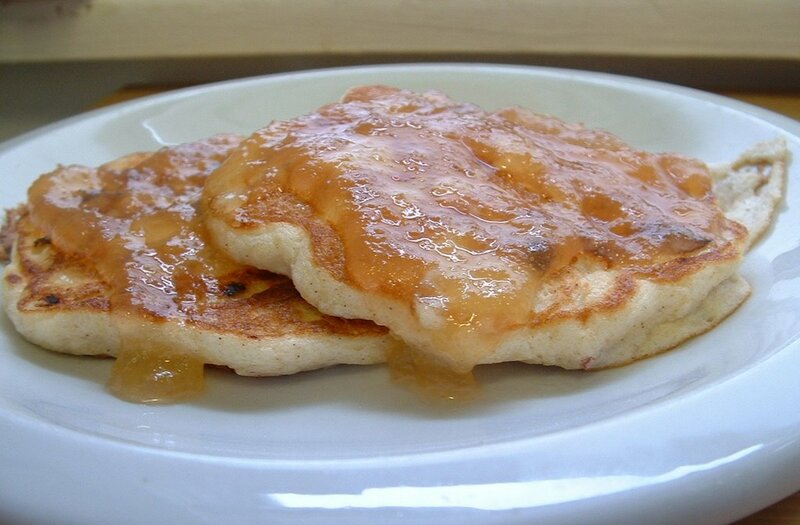 Not to worry, we just so happen to have an abundance of apples at the moment as well (sorry, Phelan), so a nice batch of Cottage Cheese Apple Pancakes was just the answer. These pancakes are very light and fluffy, with a bit of crunch from the addition of finely chopped walnuts. They are packed with protein (thanks to the walnuts, the cottage cheese and four eggs), and I usually use whole wheat flour which makes them even more healthy. We were out of maple syrup this morning, so I opened a jar of Pear Honey to use instead, and it turned out to be a great combination. If you’d like to make a batch of your own, enlarge the top photo to see the recipe. 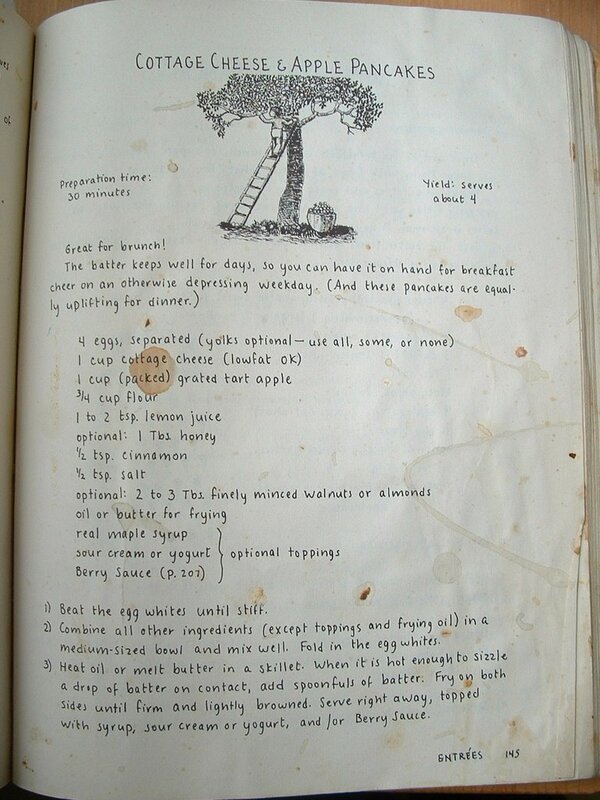 I love my Moosewood cookbook as well-in fact it fell apart recently, but I’m not getting a new one. On a similar note, we visited Ithaca last summer and we didn’t even think to go to the restaurant. Regrets. Too bad you didn’t get to the restaurant, I always thought it would be fun to go! ha! Why does everone apologize to me when they talk about apples? ~giggle~ I am ok with it, really. Someone posted an apple pancake recipe on my replies. I am going to make those up and freeze them. It’s all good. ha! Burdock boy, if you want and have access to do so, you can bring your book to a public library and ask them to send it out with their books to the bindery to have it rebound. I did that with my “Fannie Farmer” cookbook because I didn’t want to part with all of the splash marks and personal notes. You lose about one quarter of an inch all around. The cost to me was $5 US. Cheryl, these pancakes sound YUMMY. Lu – I didn’t know you could do that, what a great idea! Thanks for the tip! Thanks for the tip. I used to work at the local library so I’m sure they would be okay with it. What I’ll probably do is ask them for one of those do-it yourself binders we sometimes used at the library. I used one for my Healthy Gormet cookbook and it’s still together. I am not a fan of cottage cheese but these do sound super yummy. I think I may actualy purchase cottage cheese for the first time- ever- just for this! Thank you for sharing- the picture showing it with your pear honey makes a rumbling in my tummy. I need to make both. Yum-my! That makes me wanna cook.